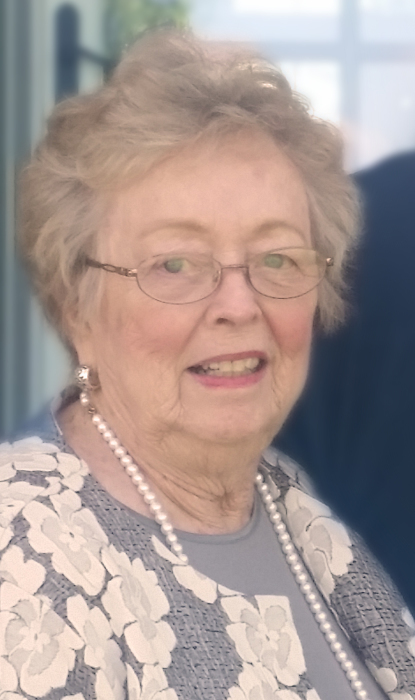 Mary Sue Jones (nee Bevan), 84, passed away on Thursday, September 6, 2018, at her home in Washington. Sue was born in Brookfield, Missouri on November 25, 1933, to the late Harold and Vaunceil (nee Evans) Bevan and raised in St. Louis. She forged lifelong friendships at Southwest High school and continued her education at Hickey Business School. On June 5, 1954, she was united in marriage to the late Robert A. Jones in New Cambria, Missouri and they settled in Washington where they raised their five children. She was an active and dedicated volunteer for the Washington community, from the early days of St. Francis Hospital (now Mercy Hospital) with over 40 years of service to the Meals on Wheels program at the hospital. She had a creative soul with many talents, her favorite artistic medium was a needle, thread, and fabric. When her children were young, she adored volunteering at the school with art projects. In recent years, she enjoyed solving Sudoku puzzles and playing cards and dominoes. She embraced her mission of being a devoted and actively involved grandmother to her nine grandchildren. By her example and shared wisdom, she encouraged their individuality and challenged them to reach their best potential. A celebration of life will be held on Tuesday, September 11, 2018, at 4 pm at Miller Funeral Home in Washington. A visitation will follow until 7 pm at Miller Funeral Home. A graveside service will be held on Wednesday, September 12, 2018, at 1 pm at East Oakwood Cemetery in Bevier, Missouri. Memorial donations are appreciated in her memory to the Meals on Wheels program at Mercy Hospital or a charity of one’s choice. Sue is survived by five children, David Jones of Montana, Mike Jones and wife Teresa of Colorado, Diana Quinn and husband Dan of St. Louis, Michele Feldmann and husband Dan of Washington, and Megan Smith and husband Jim of South Dakota; two sisters-in-law, Marilyn Lamberson of Macon, Missouri and Ginger Bevan of Texas; nine grandchildren, Dru, Reese, Ian, Anna, Matthew, Andrea, Cameron, Brandon, and Mitchell; a nephew, nieces, other relatives, and many friends. She is also survived by a close and dear group of friends affectionately called ‘the ladies’ who met every evening for dinner, cards, and dominoes and helped to look after one another. She was preceded in death by her parents, husband, and two siblings, William Bevan and Jean Pitts.